With more than half of Hondurans younger than 25 and a majority of the population living below the poverty line, the country faces great challenges in meeting the social, economic and health needs of its people. 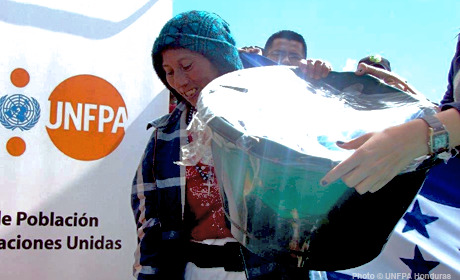 Since 1978, UNFPA has been supporting efforts to improve access to reproductive health and family planning services and sexual and reproductive health education for young people. It has also advocated at the policy level to advance gender equality and reproductive rights. Continued efforts are needed, especially given the burgeoning number of youth entering their reproductive years. San Pedro Sula, Honduras—Ana and Virginia consider themselves sisters.